- Kim has got into the National Hairdressing Competition and wants Debbie to be his model. - Annalise and Mark tell each other they'll miss each other while Annalise is away. - Pam tells Doug she's resigned from her job. Gaby is cuddling baby Zac in motherly bliss. She, Beth and Doug make smalltalk then Pam comes in, wondering where Cody is. Apparently she's gone over to Rick's place to "study". Gaby tells Pam carefully that she should call her boss back, but she says she can't work under that woman any more. Pam might sign up with a nursing agency instead, and Doug is supportive. He moans about how much paperwork he has to do in his job and wishes he could get another one. 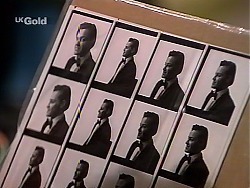 Cody and Rick are looking at the photos of him, and they can't see his rash at all. Mark is missing Annalise. Cody and Rick suggests a game of Pictionary. Ren comes in and joins them. Mark moans at her for eating all the cheese. She tells them she's thinking of joining a nanny agency to find some work. Kim comes round to ask Debbie to come down to the salon tomorrow, to practice for the competition. Debbie isn't keen, but he assures her it'll be fine. Gaby and Beth are cooing over Zac. Beth asks her if the birth was really painful and Gaby tells her to book an epidural now(!) But it was all worth it. GABY: When I first looked down at that little human being. Perfect little fingernails and tiny ears...I remember thinking ever single moment's been worthwhile. Don't be scared. BETH: I'm not scared. Well, maybe just a little bit. You make it sound so beautiful. BETH: I'm starting to get excited. I just can't wait to *have* him. Her. Whatever, as long as it's healthy. Oh, Gaby, you should see Brad, he's clucky like you wouldn't believe! Cody comes in and Gaby admonishes her for not studying enough. Gaby is stalking towards the Lassiter's Office when Rick comes over to see her. He asks her if he can have his contract. 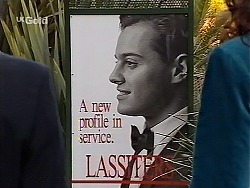 Just then, they see a giant profile shot of Rick on a poster with the caption "A new profile in service". Both Gaby and Rick are delighted with it. Cody comes to call for Debbie for school, but she tells her she's going to the salon instead. Cody moans about not having anywhere quiet to study. Debbie says Cody can come round to her house to study if she wants, but not tonight as people are coming to dinner. Gaby is ranting about Alan Crowley who is apparently a creep who talked down to Gaby. Ren comes in sponges free food off Mark, who is not impressed. Kim introduces Debbie to Vanessa and Nadine the stylists. Debbie is quite uncomfortable as they fuss over her hair. Pam is on the phone to the nursing agency, who have given her an evening shift tonight at a nursing home. Gaby is making a list of things to take to Darwin. She is upset about Alan Crowley being horrible to her - apparently he told her he didn't think she was capable of handling the work in Darwin. Pam reassures her that she's more than proved herself, and anyway, what would Alan Crowley know. 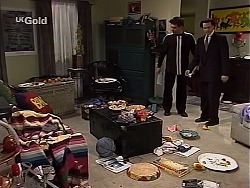 Mark and Rick comes home to a very messy place. Ren tells him that she's had a bit of a party and says it won't take long to clean up. Mark is not pleased. Gaby is on the phone trying to organise a few things in Darwin. Pam is sewing and Doug is shouting about. Cody is trying to study. She is totally fed up and stomps off. No- one notices. Gaby tells Doug that he could put in a quote on the hotel contract in Darwin and resurrect Willis Constructions. 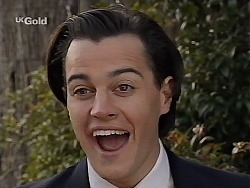 Pam thinks this is a good idea, but Doug says he can't leave Erinsborough - it's his home. Cody puts on some overalls to keep warm and attempts to study. Vanessa, Nadine and Kim are still working on Debbie's hair. Debbie is pretty fed up but is being very patient. Pam is off to her nursing shift on her bike. Doug warns her to watch the roads as it's raining. Beth arrives home, and Doug decides to go out for a while and sit in his truck to get away from Pam's mother! Doug arrives in the garage to find Cody studying. Doug says that it'll be quieter in the house soon, and says Cody can't work properly in the garage. Cody suggests she and Doug blow off dinner and go out for fish and chips! Ren is tidying up when Mark and Rick come home, but she hasn't made much progress. Mark tells her that she has to pull her weight around the house. She promises she'll get herself sorted but he doesn't look convinced. Kim is trying out another hairstyle on Debbie. 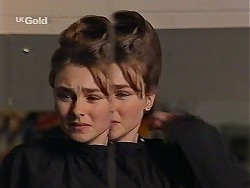 Vanessa and Nadine are laughing in the background and Debbie gets upset and runs out, saying she can't help being ugly.